Erdinger is one of the first "good beers" that I ever had, it was also probably the first beer I had legally when I bought it in Germany. It is one of the only breweries in the world that produce just Weizen (wheat) beers. I know that dark beers aren't everyone's cup of tea but from my vague memory of it this one should be universally like. A weizenglass really is a must when drinking wheat beers, as they brilliantly emphasize the colour of the beer, and allow the standard massive billowy head to show-off. Also the best bottle opener I own is from Erdinger, if your ever in need of a new opener they are on ebay for about $4. Now onto the beer, the pour is just fantastic for the style. The first thing you notice is just how much head there is in one of these beers. The heads colour is creamy and it has large air bubbles throughout, as you can see in the picture. The beers colour is a dark mahogany colour, which lightens to almost an amber colour at the edges of the glass. It really is a sensational looking beer! This beers nose is rather complicated to describe, and it may sound strange when I say some of these things that this beer reminds me of, but trust me it is good. It has a strong yeasty smell, with lots of spice esters, clove being the most prominant. There are some ripe dark fruits, but there is also a mint like characteristic, alot like chewing gum. As strange as this sounds it also seems to smell like coke towards the end, I'm sure that all sounds strange but it is a nice smell, trust me. I would say this is one of the easiest dark beers to introduce people to dark beers. It has quite a mild taste, which is none the less fantastic. There are trace ammounts of banana and cloves straight away, followed by some lightly roasted malts. A caramel finish is not at all dry and adds excellent depth to the beer. Despite the enormous head there is little to no carbonation, however with some swilling this beer will lace. This is a fantastic easy-drinker Weizenbier! I cannot recommend this highly enough to German beer fans or people who haven't had one before, this beer honestly has something to provide to everyone. 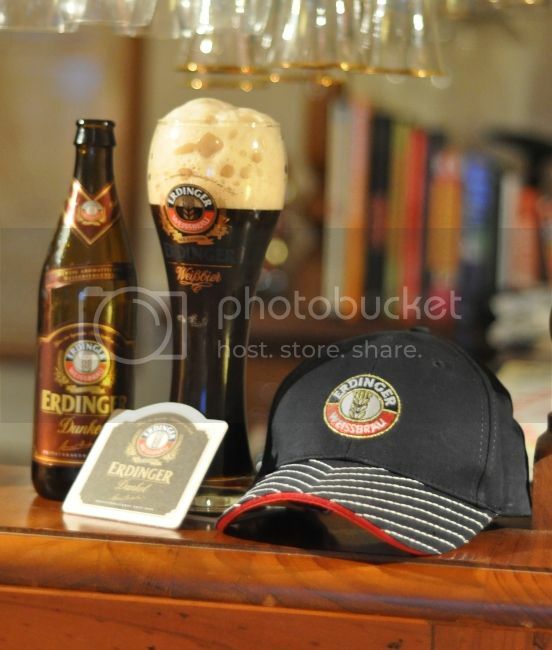 Erdinger Dunkel isn't so sweet that it will offend, but doesn't have the bite of a pilsner, actually it has no bitterness! I will happily go buy more of these and I recommend that anyone who reads this should do the same!